From left, Mark Boughton, Timothy Herbst, Steve Obsitnik, Bob Stefanowski and David Stemerman. Fairfield — A question about eliminating the income tax sparked a protracted exchange of charges, countercharges, and insults Tuesday between the two Republican gubernatorial contenders with the least political experience and biggest television advertising budgets: businessmen David Stemerman of Greenwich and Bob Stefanowski of Madison. Stemerman mocked Stefanowski for always talking about his career as a senior executive at GE, but seldom mentioning his last job in the corporate world — as chief executive of DFC Global, a company whose services include pay day loans. Stefanowski responded by dismissing Stemerman as a glorified stock trader guilty of “skimming profits” from pension funds. Danbury Mayor Mark Boughton, former First Selectman Timothy Herbst of Trumbull and Westport tech entrepreneur Steve Obsitnik were sidelined for long stretches, watching Stemerman and Stefanowski brawl, occasionally disengaging long enough to jab at Boughton and Herbst. They seemed to forget Obsitnik was on stage. With varying degrees of aggressiveness, the rest of the field taunted Stefanowski and Stemerman for their past lives as Democrats — Stemerman 15 years ago and Stefanowski as recently as last year, when he rejoined the GOP shortly before announcing his intention to the seek the party’s nomination for governor. 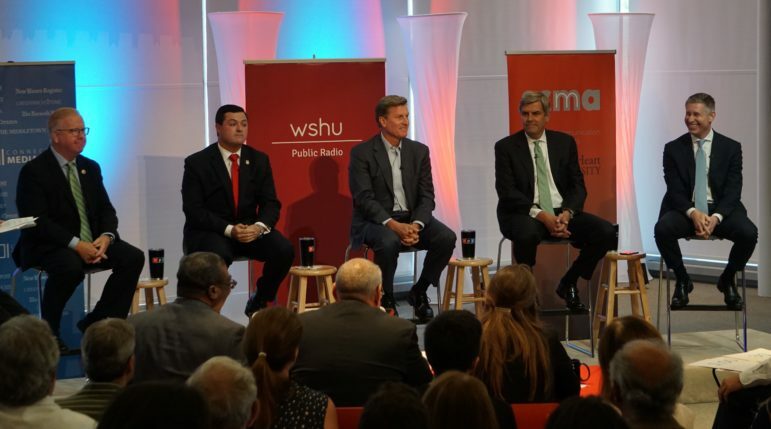 The 90-minute debate held at Sacred Heart University in partnership with the Hearst Connecticut Media newspaper chain and WSHU, a public-radio station, most likely portends a raucous final three weeks of campaigning on the ground and on television before Republicans go to the polls on Aug. 14 to choose their nominee for governor. Stemerman, who made a fortune managing a hedge fund and is largely self-funding his campaign, already has spent $4 million, more than half on television and digital advertising. Stefanowski, who also is largely self-funding, has spent $1.88 million, including $1 million on television. The other three are participants in the state’s voluntary Citizens’ Election Program, which limits their spending for the primary to $250,000 in contributions and $1.35 million public-financing grants. So far, Herbst has spent $803,080; Boughton, $774,023; and Obsitnik, the last to quality for public financing, just $168,882. Bob Stefanowski and David Stemerman share a laugh. The mood didn’t last. The jumping off point for the sharpest exchanges Tuesday came in response to a question about whether they would support eliminating Connecticut’s single largest tax, the levy on wages imposed in 1991 when the state’s economy and real-estate markets had cratered, and the state’s taxes on investment income and sales tax were insufficient to balance the budget. Boughton and Stefanowski have promised to eliminate the income tax over eight or more years, never saying how a state already facing multi-billion-dollar deficits could do without the $9 billion Connecticut annually raises through its tax on wages, capital gains and other sources of income. It covers about 40 percent of the $20 billion annual budget. Stemerman said Connecticut is buckling under the weight of unfunded pension liabilities and debts run up by politicians who catered to public-sector unions, promising Connecticut citizens it was affordable. But Stemerman said Stefanowski, as a businessman who worked in finance, should be embarrassed to offer a tax plan that he calls a fantasy. Stefanowski returned the insult. “That’s quite a slam. I own stocks, yes,” Stemerman said. Then he turned to Stefanowski’s time in the payday lending industry. Stefanowski said he fired 20 of the top 30 executives at DFC, turning around a company that had defrauded low-income customers. When it was Boughton’s turn to finally speak, he was asked if he could remember the original question. Boughton replied that he could not, though he was entertained by the previous exchange. The mayor of Danbury, a city of about 80,000 that regularly gets attention as a livable city with low unemployment and stable finances, defended his call for eliminating the income tax as a call to arms by Republicans. Boughton lost the GOP nomination for governor in 2010 and 2014 to Tom Foley, a businessman who twice lost to Gov. Dannel P. Malloy. Stefanowski, who sounded at times like an acolyte of Norman Vincent Peale, author of “The Power of Positive Thinking,” urged Republicans to ignore the naysayers. “We need people who say it can be done,” he said. Herbst said the facts do not support Stefanowski’s positive thinking. “Let’s take a little stroll down memory lane. Lowell Weicker told us that the income tax would be temporary,” Herbst said. Weicker never proposed the income tax as a temporary measure, though it is an urban myth that has taken root in recent years.